A framing nailer (sometimes referred to as a framing gun or a nail gun) is one of the essential tools on any home building site. A quality framing nailer will drive a number of nails into a framing assembly faster than a skilled carpenter can drive one framing nail with a hammer. This speeds up the process of framing a wall (or a house for that matter) exponentially. Used properly, a framing nailer is a highly-productive woodworking tool. Used improperly, a framing nailer can be a hazardous piece of equipment that can quickly cause a severe injury. There are two predominant types of framing nailers: pneumatic framing nailers and cordless framing nailers. 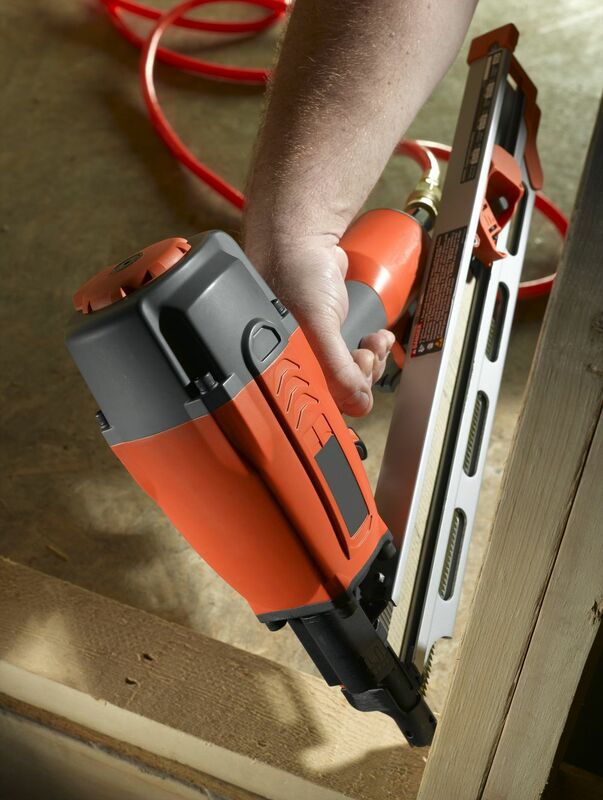 A pneumatic framing nailer requires an air compressor to deliver air to the tool via a length of hose. When the pneumatic framing nailer drives a nail, the compressed air from the hose drives a piston which in turn drives the nail into the wood. The cordless framing nailer works much in the same way, but the pressure to drive the piston typically comes from a disposable compressed air canister that fits inside of the nailer. This canister, in combination with a battery to help activate the charge, drives a predetermined number of nails before it must be replaced with a fresh canister. While the pneumatic framing nailer tends to be faster, one has to contend with the tether of a hose to the air compressor (not to mention that the air compressor has to have a big enough tank to keep the pressure-hungry framing nailer fed with air), while the cordless unit can require a couple of seconds of preparation time before it is ready to fire, and one has the added expense of buying compressed air canisters. That being said, either type will sufficiently handle the workload one can expect to encounter on a framing job. Another consideration one must keep in mind when using a framing nailer is the type of nails used in the nailer. Some framing nailers have a long magazine that holds a couple of sets of stick nails (up to about a hundred nails depending on the type of nail). Other framing nailers utilize a coil of nails in a round magazine. As with the type of framing nailer, the choice between stick-style of coil-style is a matter of preference. What may not be a matter of preference, though, is the type of nail used. Some nailers utilize clipped-head nails, which are not a fully-round nail head, but instead a crescent moon-shaped head. This type of head allows for more nails per magazine, but some building codes prohibit the use of clipped-head nails. Be sure that you know the local regulations and requirements before you begin a project using clipped-head nails. A framing nailer has a large cylinder that is directly above the nailer's tip (from which the nails are driven). The tip is a safety feature that must be depressed against the wood before the trigger will fire. To fire the nailer, align the cylinder and nail tip in the direction that you want the nail to fire. Press the nailer into the wood to depress the nail tip before pulling the trigger. The nailer should fire a single nail into the wood with the head slightly depressed (about 1/8-inch). Should the nail need to be sunk into the wood a bit more or less, you can adjust the depth adjustment on the nailer (consult the operating instructions for the location and use of your nailer's depth adjustment). Framing nailers typically come with two types of interchangeable triggers: a bump-fire trigger and a standard single-fire trigger. With the single-fire trigger, you must press the nail tip against the wood and pull the trigger for each nail fired, whereas with the bump-fire trigger, you hold down the trigger and "bump" the nail tip into the wood to fire a nail. Bump nailing is much faster, but single-firing is more controlled and precise. I'd recommend using the single-fire trigger until you have a solid handle on the safety and operation of the tool before attempting to use the bump-fire trigger. There are two styles of nailing that are typically accomplished with a framing nailer: through nailing and toe-nailing. Think of through nailing as driving one nail square (or perpendicular) to the face of the board into another. This is the more simple and common method of nailing with a framing nailer, and should be mastered first. However, there are times where the nailer may not be able to be used to drive the nails squarely, and a nail must be driven in at an angle. This is called toe-nailing. The procedure is the same as through-nailing (position the nailer at the desired angle for the direction of the nail, depress the nail tip and pull the trigger), but getting the angle just right so the wood doesn't split or the tip of the nail doesn't show through the back side of the assembly can take some practice. As with using any power tools, always wear appropriate safety equipment, including safety glasses, hearing protection (as framing nailers can be rather loud) and wearing of appropriate clothing. Keep in mind that the safety features of a framing nailer are not a hindrance, but a necessity. For instance, the nail tip of the nailer should never be disabled or removed in an effort to increase speed. Such a nailer is akin to a handgun without a safety, and make no bones about it, a framing nail can be as devastating to the human body as a bullet. Also, I've seen some users pull the nail tip back with one hand while firing with the other. This is another bad idea, as nail guns can misfire. Personally, I value my hands a little too much to attempt such an ill-advised stunt. And speaking of misfiring nails, should the nail head jam, all framing nailers have a quick and easy method for opening the head of the nailer and removing any jammed nails. While a well-maintained nailer should misfire less than 1% of the time, it does happen on occasion, so read your operator's manual on how to clear a misfire to be prepared for when it does occur.